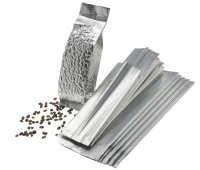 The new K-Vac vacuum aluminum gusseted bags for food metallised with 500 ml capacity (50 pieces) are ideal for light-sensitive products such as coffee, tea and spices, as well as industrial products or commercial components effectively protect under vacuum. Currently available in 3 different sizes. Usage Note: Simple household vacuum machines of other manufacturers often can not seal these aluminum composite vacuum bags! Available as (VE) 50 Pc.